Once again, this year’s Great Migration was a magical moment. Florian Keller, Managing Director of Enchanting Travels regales with his recent wildlife tales in the Serengeti and highlights his top viewing spots for Africa’s most exciting annual safari event. While the central Serengeti can be quite crowded due to several large lodges, there are still completely untouched areas to the south east of Seronera where we spent almost two hours completely alone observing a male lion and later on two cheetahs who were feeding on a gazelle. This area of the Serengeti also has spectacular landscapes – gently rolling savannah interspersed with scenic rock formations (kopjes). 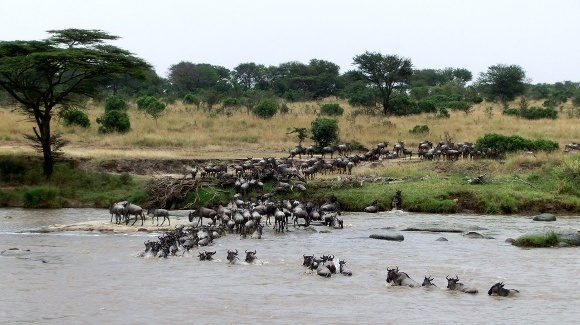 The savannah plains around the Mara river were filled with migrating wildebeest as far as the eye could see. Driving through these herds and observing the behavior of the animals running in all directions was an awesome experience. 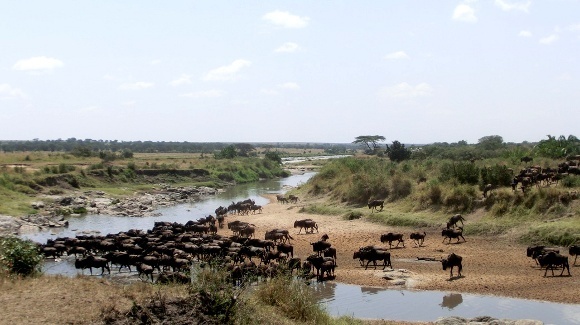 As we’ve highlighted before, there is no better camp to witness the famous river crossings than Olakira Camp, located only a couple of hundred meters from the Mara River and overlooking several crossing points. During lunch, we suddenly saw dust in the distance that our guide quickly realized came from thousands of wildebeest and zebra hoofs throwing themselves from the riverbank into the river. Lunch was immediately forgotten: we jumped into a vehicle and rushed to the crossing point where we witnessed the fascinating spectacle of thousands of wildebeest and zebras crossing the crocodile-infested Mara river. 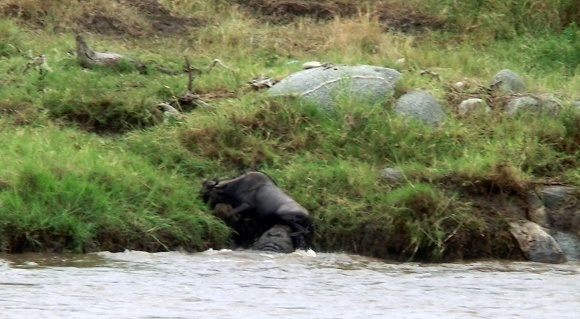 One particularly dramatic observation was a wildebeest that struggled for 10-15 minutes to get up the steep riverbank. The animal visibly became desperate and we held our breath when we saw a huge crocodile slowly and menacingly approaching the exhausted wildebeest. The crocodile moved closer and closer and the wildebeest made a final desperate attempt to climb up the riverbank but again failed, when the crocodile suddenly shot out of the water with his gigantic jaws wide open and grabbed the wildebeest at its hind legs. For several minutes, the wildebeest struggled and stayed above the water line but gradually, the crocodile managed to drag the wildebeest to deeper water levels where they both eventually disappeared. 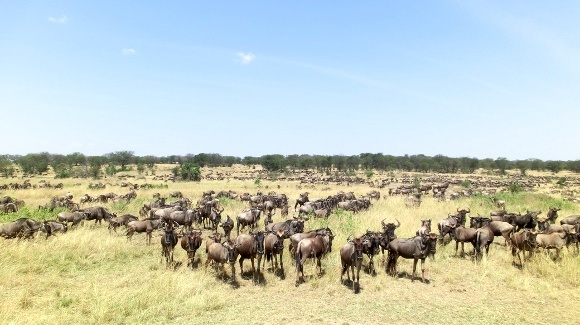 I have always dreamt of walking right through the herds during the Great Migration. This dream came true on our last morning on a walking safari along the Mara river from Sayari Camp. 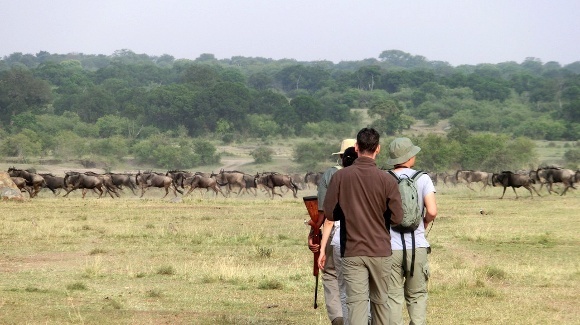 After walking around a thicket, we suddenly saw tens of thousands of wildebeest in the plains in front of us. We carefully walked towards them, but they immediately took off – seeing thousands of wildebeest in a mad stampede is simply incredible! Upon our departure, the migrating wildebeest even delayed our take-off for a couple of minutes; several thousand of them had decided that the grass on either side of the airstrip tasted particularly good. As the pilot slowly steered the plane towards them to clear the runway, another wildebeest stampede bid us good bye. Would you like to experience the Great Migration for yourself? 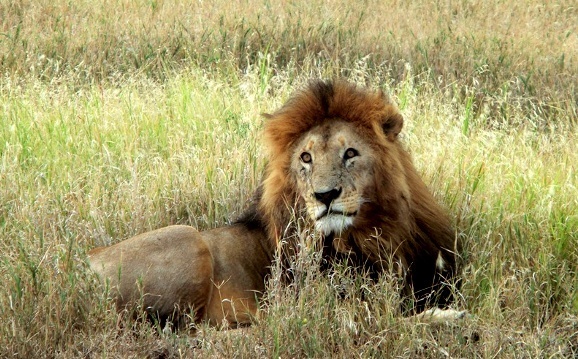 Begin by designing your personalized safari in Africa and speak to one of our expert Travel Consultants today.